Tiff is 81% NFQHA (F0032131). 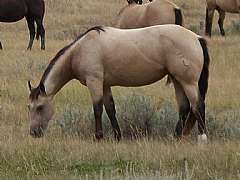 This is a beautiful buckskin mare. She is one of five fillies that we purchased from Grantier Quarter Horses as a weanling and we have brought her along ourselves. You can read more about her on our mares information page and you can find Grantiers on our links page. Tiff fantastically goes back to King P-234 11 times!!! Her pedigree is full of old time speed. 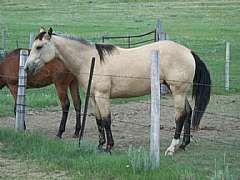 She is the perfect combination mare for the cow bred horses and she makes a nice match for any of our stallions. She has done everything we have asked her to do. She was started under saddle summer 2008 by Ella and Warren at a Craig Cameron colt starting clinic. She is very athletic and built tough with excellent withers, big hip, nice bone and muscling while keeping her femininity. 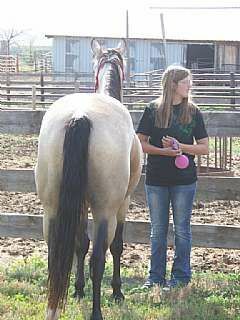 She suffered a pretty severe wire cut across the front of her hock as a yearling that looks pretty tough cosmetically. However, she stood up very well to the ‘starting’ process. She has everything we look for in a saddle horse with a wonderful disposition and we just really like her ‘look’ as well. Tiff foaled a VERY nice 2010 buckskin filly, Paddys Gin Dakota JW; 2011 bay stud colt, Paddys Gin Boba JW and a palomino filly, Paddys Gin Sage JW. 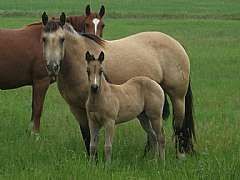 All three foals are by TRR Paddys Texas Gin and she was pasture exposed to him again for 2013. She had a bay filly Paddys Gin Boogie JW. Tiff was pasture exposed to our new Paddys Irish Whiskey son, Whoop Up Whiskey aka Whoop, for 2014 and had a bay stallion, Whiskey Up Stitch JW. 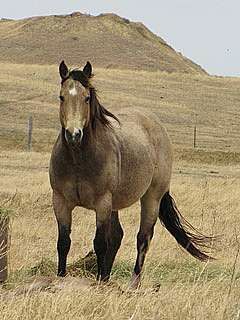 She was exposed to Whoop again for a 2015 foal and had another stylish brown stallion, Whiksey Up Amigo JW. She is another case of "if it's not broke don't fix it" she was exposed to Whoop and had another stylish bay stallion, Whiskey Up Torino JW. She had another Whoop baby, brown filly, Whiskey Up Shenzi JW. So we are switching things up a bit for 2018. 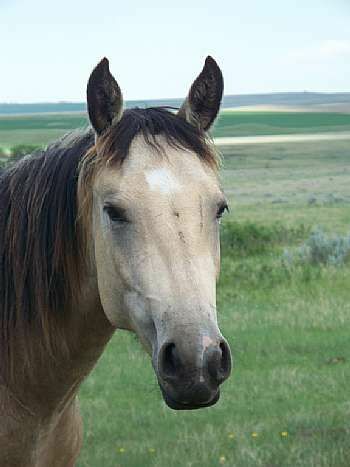 We have exposed Tiff to our new stallion, Jacks Our Bartender and she had a dark bay roan stallion, Morocco Bartender JW. For 2019 we have put her back with Tex. Woroniecki Ranch Quarter Horses. All rights reserved. Proudly designed and hosted by Big Sky Internet Design.